The index opened weak below 8900 and stayed weak throughout the entire session of trade, making new lows with each passing hour to close near the bottom at 8756.75, huge loss of 181.00 points, and the biggest drop in recent times. The broader market was negative, with 446 advances to 1067 declines. Developing Range as per Option Table comes at 8500-9000. 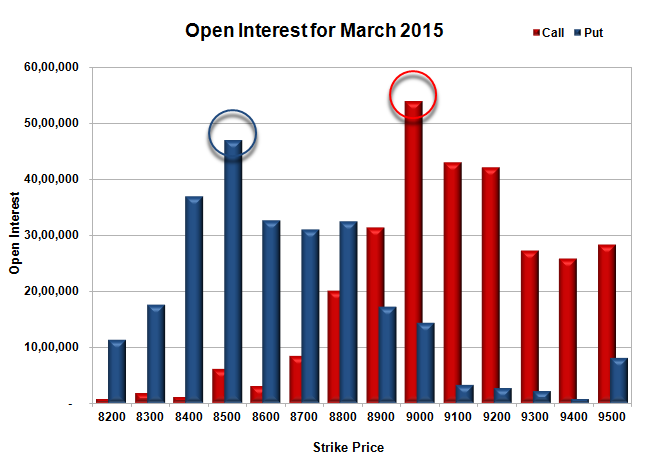 Call option 8700-9100 added huge 44.80 lacs OI with profit booking seen at 9200 and above strike prices. 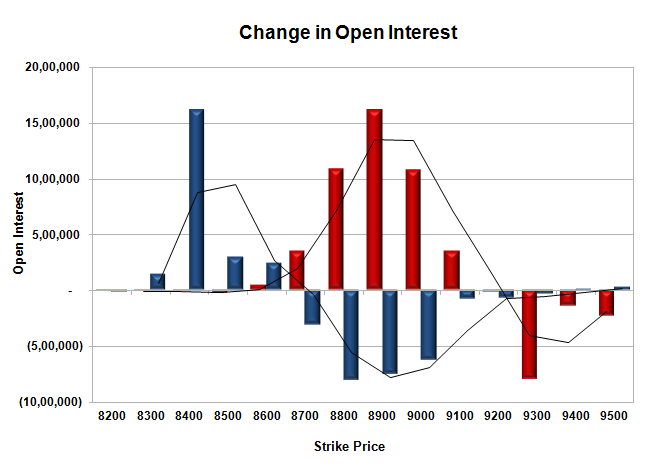 Put option 8600-8300 added huge 22.98 lacs OI with huge short covering seen at 8800 and above strike prices. Nifty Open Interest is at 2,50,18,125 down by 10,66,125, with decrease in price, most probably huge long liquidation. Bank Nifty Open Interest is at 23,02,925 down by 26,825, with decrease in price, most probably long liquidation. FII’s sold huge 19.78 lacs Futures, which includes 61392 contracts long liquidation and 17712 contracts short build-up, with decrease in net OI by 43680 contracts (includes 107470 longs to 186574 shorts for the day) and the Average Price comes to 8866.39. FII’s Index future open contract as on date is 809271 Longs to 112729 Shorts, net long 696542 down by huge 79104 contracts. Initial support now at 8700, with OI of 31.05 lacs and below that at 8500 with huge OI of 46.95 lacs. Initial resistance at 8900, with huge OI addition of 16.16 lacs and above that at 9000 with highest OI of 53.91 lacs. 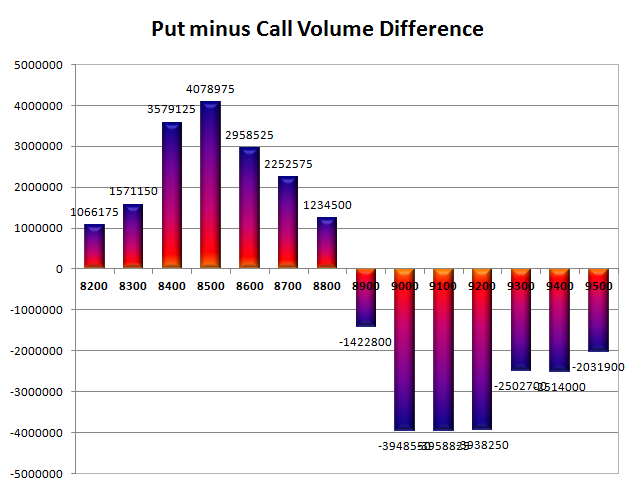 Day Range as per Option Table is 8695 - 8879 and as per VIX is 8684 - 8829 with 8796 as the Pivot.